Madrid new year´s party is the city´s way of warming up during the cold of winter. Well that and the Spanish culture demands the mounting of a "Fiesta" for the smallest of reasons! Either at home or in the many bars and discos there are some Spanish traditions that are observed and maintained with almost religious devotion by the party happy Madrileños! Welcome in the new year in the same way you intend to spend it! The centre of the city is where all eyes turn as Midnight of the 31st December approaches. Although a famous Madrid landmark in its own right, on new years eve it becomes the center of attention for the whole nation. The clock mounted in the roof of the offices of the "Ayuntamiento de Madrid" (City hall) is broadcast accross the country and its chimes mark the end of the old and the begining of the new year. Worthy of note is the fact that the advertisment shown on television immediately after the last chimes occupies the most expensive advertising spot of the year! In one of those traditions that is curiously Spanish the Madrid new year celebrations are marked with by the consumption of....Grapes. Not in the liquid form either! A long standing tradition is that as each chime rings out you eat / swallow a whole grape before the next chime peals. The intention being that by the the time the final chime rings you have eaten twelve whole grapes! Previously many of those people going out for the evening took their own grapes with them... However it is now common to find that the bars and restaurants will provide them free at around a quarter to midnight. Of course for those at home buying a bunch of grapes on the 31st December can become an expensive business as Madrid´s (and indeed all of Spains) shopkeepers take advantage of the captive market and put up prices. 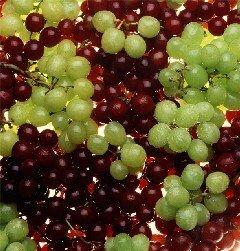 One final note on the Madrid new year tradition is that the grapes are normally seedless unless the bar or restaurant owner has decided he wants to save by buying the cheaper seeded type. Of course just about every bar stays open to the full extent of published opening hours and some even go beyond this. Typically the morning of the 1st January you will find alot of people just finishing the "night" and preparing to deal with the "effects"! Whilst you may not be visiting at the time of the Madrid new year celebrations ..... there are other cultural aspects of the city that you can experience year round!